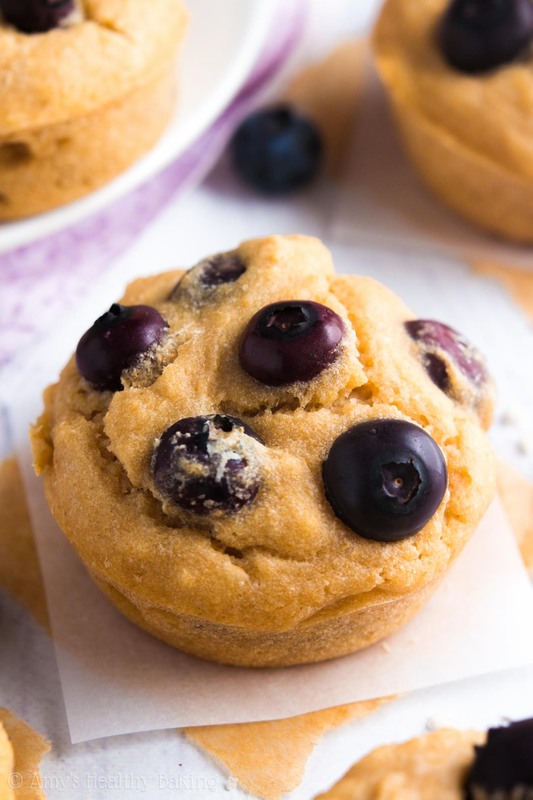 An easy recipe for buttery muffins full of big juicy berries. They have the same texture as cupcakes—but none of the guilt! These truly are the BEST! My sophomore year of high school, our marching band flew to Hawaii to spend Spring Break in Honolulu. Our director organized a parade performance one morning in Waikiki, as well as a symphony concert at a school located just a few blocks from our hotel, but he scheduled plenty of free time and fun activities for the rest of our week-long vacation. We attended a comedy show just a few hours after our planes landed at the airport; toured some of the most historic spots in the city by bus, including Iolani Palace, the home of the final monarchs before Hawaii became the 50th state; walked around Pearl Harbor and the USS Arizona Memorial for almost an entire day; and dined at two different luaus, complete with flaming-baton-twirling hula dancers. Since our hotel lacked a large dining facility that would fit all 250+ band members along with the nearly 50 parent chaperones, our director arranged for us to eat breakfast at a separate buffet-style restaurant a quick two-block walk away. The owner opened the doors for us from 7-9 am each day of our stay, and we could wander over whenever we woke up and felt hungry. Most of the food fell under the traditional “Continental Breakfast” category, with plenty of scrambled eggs, bacon, sausages, and hash browns served in hot chafing dishes; bagels and bread for toasting; and lots of fresh fruit. I always looked forward to the big, juicy spears of fresh pineapple! The restaurant also offered a wide selection of pastries, in addition to the bread and bagels, that they set out in large linen-lined wicker baskets. We found croissants (both plain and chocolate-filled! ), glazed donuts, sticky buns, and multiple flavors of mini muffins, including double chocolate, lemon poppy seed, and blueberry. On our first morning there, I grabbed a blueberry muffin to go along with my pile of pineapple. Upon biting into it, my first thought was, “This is heavenly—it’s the best blueberry muffin I’ve ever eaten!” It was supremely moist, probably due to ample amounts of sour cream, and incredibly buttery. I felt like I was nibbling on a cupcake—and I quickly dashed back to the buffet line to grab two more! 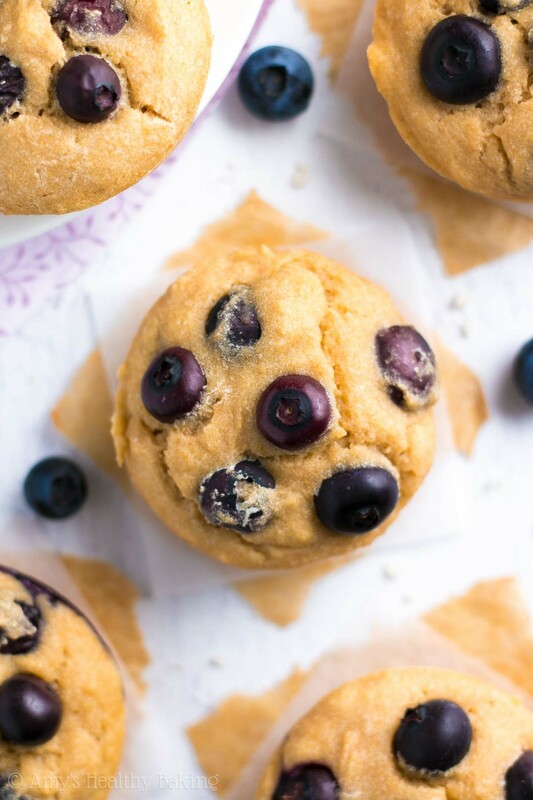 Although I’m much more health-conscious now, I still enjoy blueberry muffins just as much as I did back then, so I’ve been working on perfecting a healthier version of those treats I fell in love with on Hawaii. 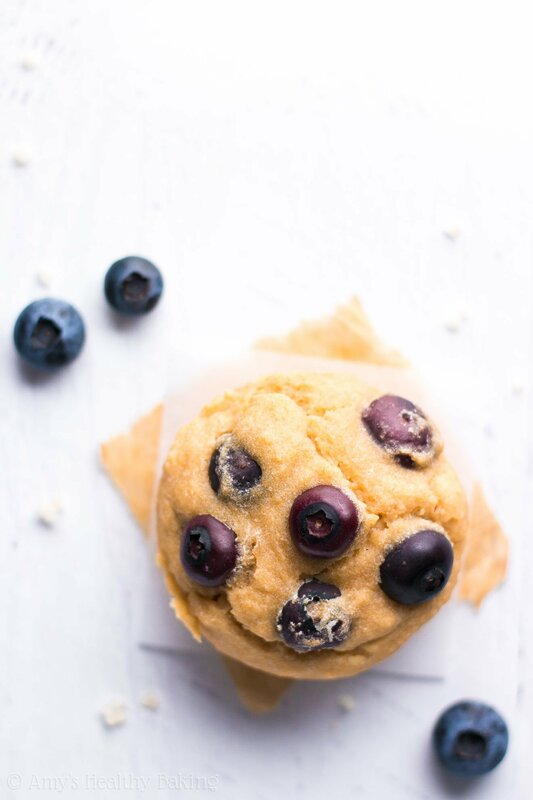 And I finally did it… These are the Ultimate Healthy Blueberry Muffins! They’re supremely tender, full of juicy berries, and come with none of the guilt of traditional recipes! 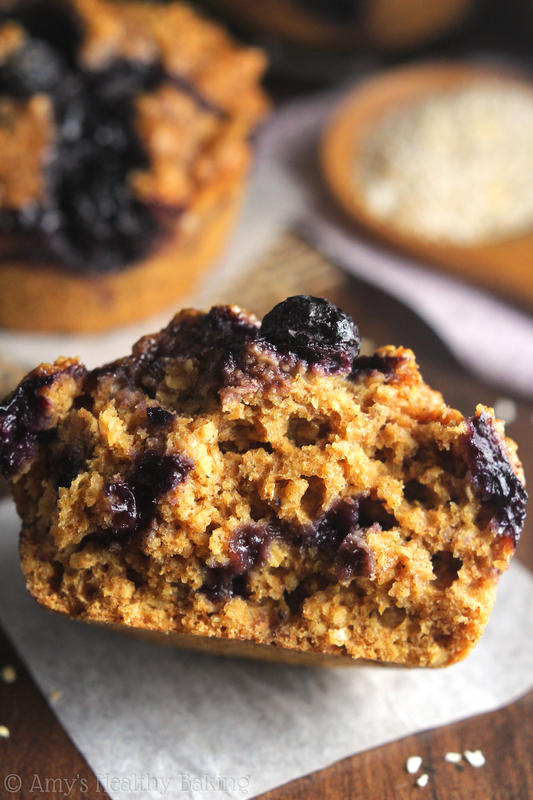 This easy muffin recipe begins with white whole wheat flour. White whole wheat flour is made by finely grinding white wheat, whereas regular whole wheat flour comes from red wheat. This gives white whole wheat flour a lighter taste and texture, closer to that of all-purpose flour, but with the same health benefits as regular whole wheat. Whole wheat pastry flour would be a great option, as well. Note: I included my favorite gluten-free flour blend in the Notes section beneath the recipe! Greek yogurt! It adds the same moisture to the muffin batter as extra butter or oil but for a fraction of the calories. Greek yogurt also gives them a protein boost too… One cup of Greek yogurt contains 20g+ of protein! (Regular yogurt contains closer to 8-10g of protein instead.) I like to buy a big tub of plain Greek yogurt and simply scoop out whatever I need because it’s much cheaper than purchasing the single-serving cups. 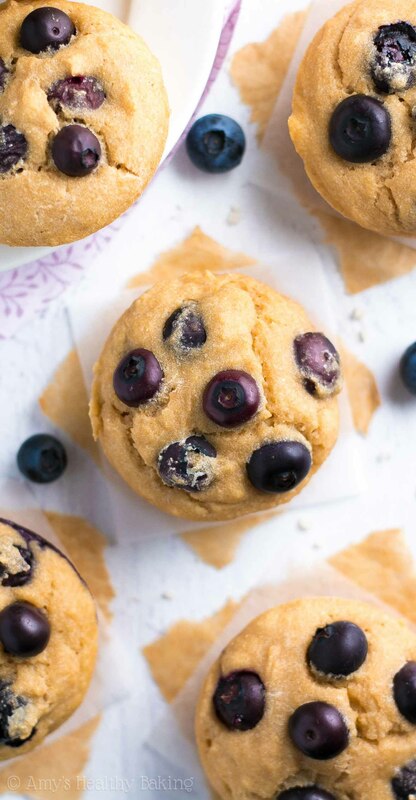 Some of my recipe testers found that the muffins sweetened with only vanilla crème stevia had an very tiny, ever-so-slightly bitter aftertaste, which is why you’ll also use a couple tablespoons of honey. Agave would be a good substitute, but I’d caution against pure maple syrup since that has a fairly iconic flavor of its own. And finally, the best part… The blueberries! 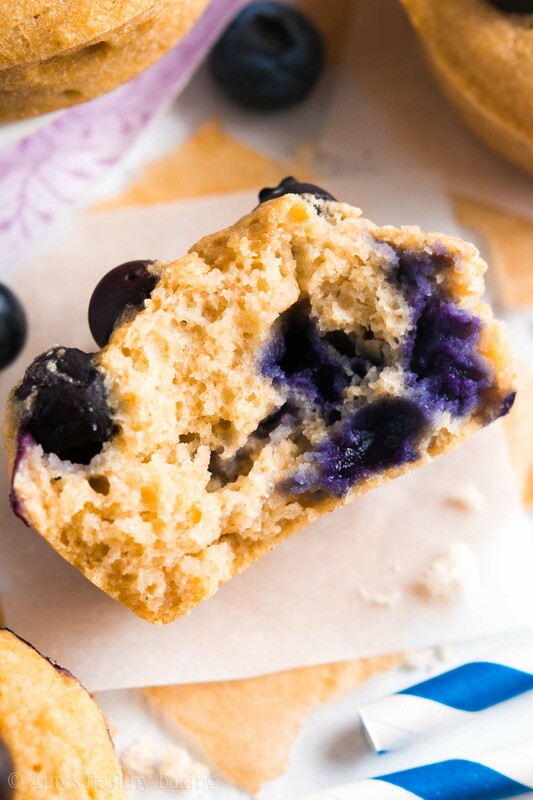 I highly recommend fresh blueberries for these muffins. You just can’t beat their sweet, juicy flavor! 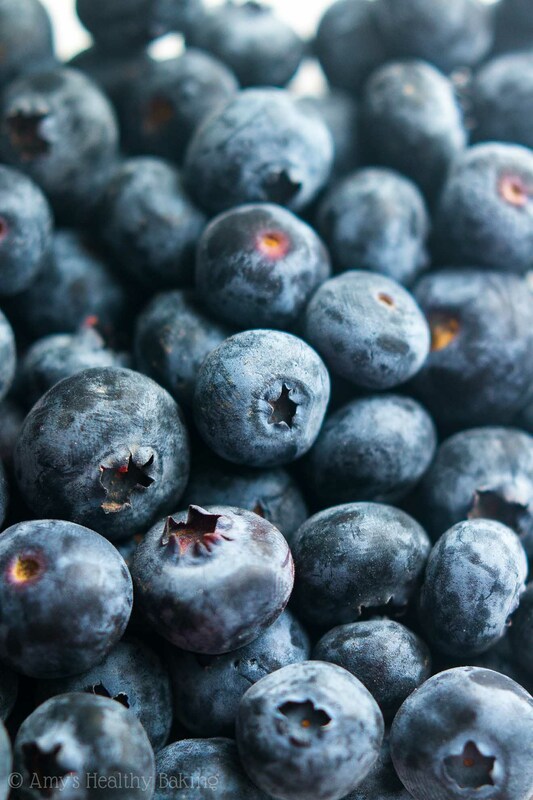 Additionally, fresh blueberries will not bleed when folding them in or turn the batter a murky gray color. Frozen will work in a pinch, as long as you don’t mind the batter’s discoloration, and I’d recommend tossing them in a little bit of flour first to minimize that. Now who’s ready for breakfast?? 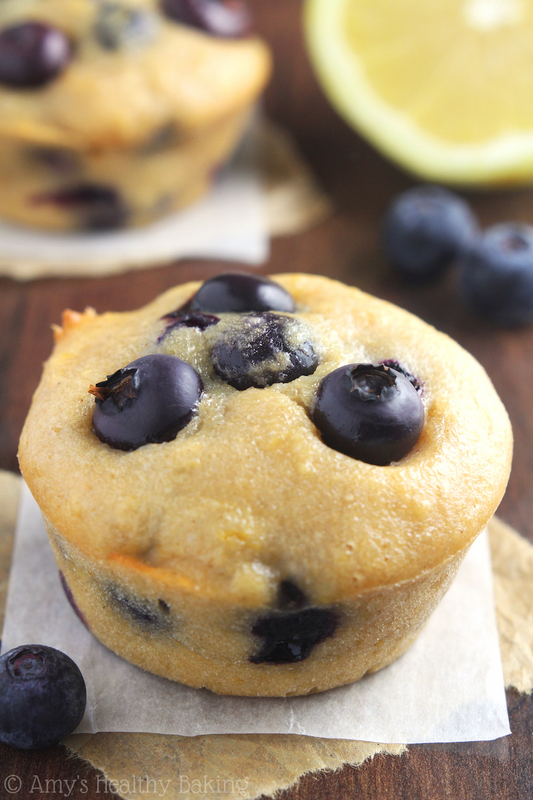 These healthy muffins are full of warm, buttery flavor and big juicy berries. 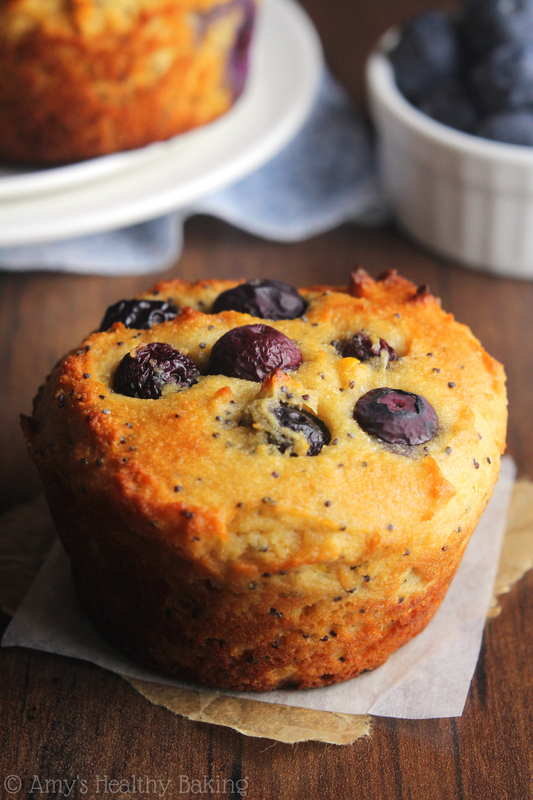 They’re perfect for quick on-the-go breakfasts and snacks! Leftovers will stay fresh for at least four days if stored in an airtight container in the refrigerator. In a medium bowl, whisk together the flour, baking powder, and salt. In a separate bowl, whisk together the butter, egg whites, and vanilla. Stir in the Greek yogurt, mixing until no large lumps remain. Mix in the honey and stevia. Alternate between adding the flour mixture and milk, beginning and ending with the flour mixture, and stirring just until incorporated. (For best results, add the flour mixture in 4 equal parts.) Gently fold in 1 cup of blueberries. 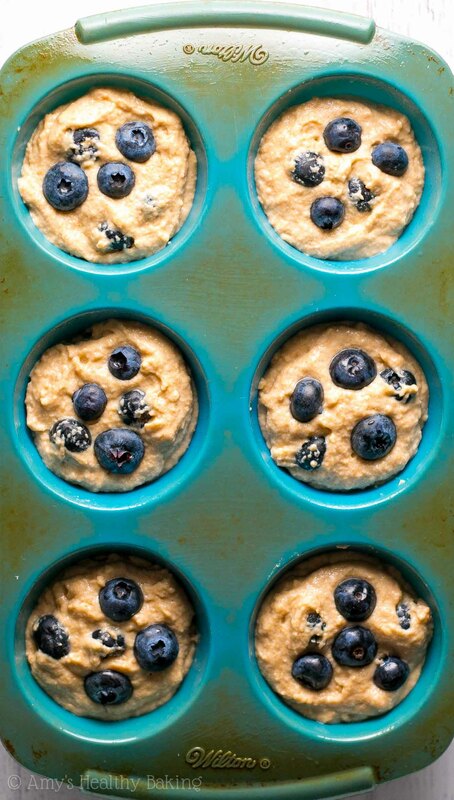 Divide the batter between the prepared muffin cups, and gently press the remaining blueberries into the tops. Bake at 350°F for 19-22 minutes or until the tops are firm to the touch. Cool in the muffin cups for 10 minutes before carefully transferring to a wire rack. Notes: For the gluten-free flour, I recommend the following: 1 cup (120g) millet flour, ½ cup (60g) brown rice flour, ½ cup (60g) tapioca flour, and 1 ½ teaspoons xanthan gum. Most store-bought blends will work as well, if they're measured like this. Agave or pure maple syrup may be substituted for the honey. If you prefer to substitute additional honey for the vanilla crème stevia, you'll need to add 6 more tablespoons of honey and reduce the milk by approximately the same amount, or slightly less. 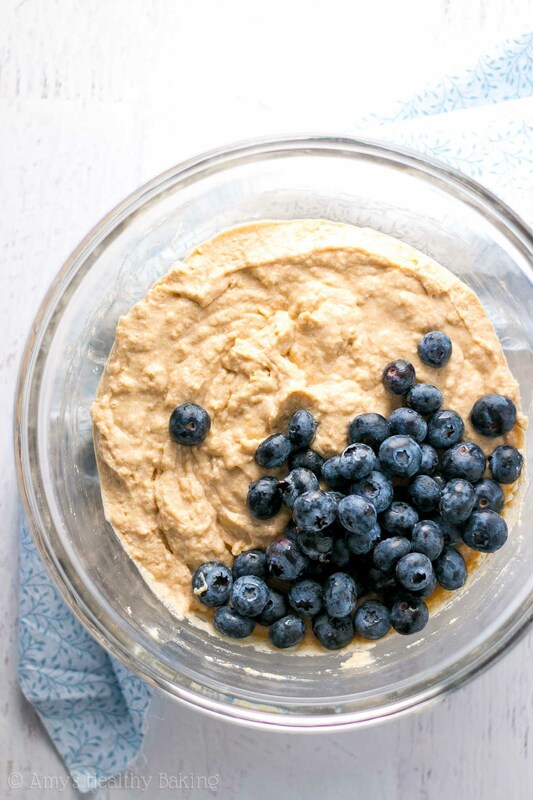 Fresh blueberries work best because they have better flavor and don’t bleed when incorporating them into the batter. 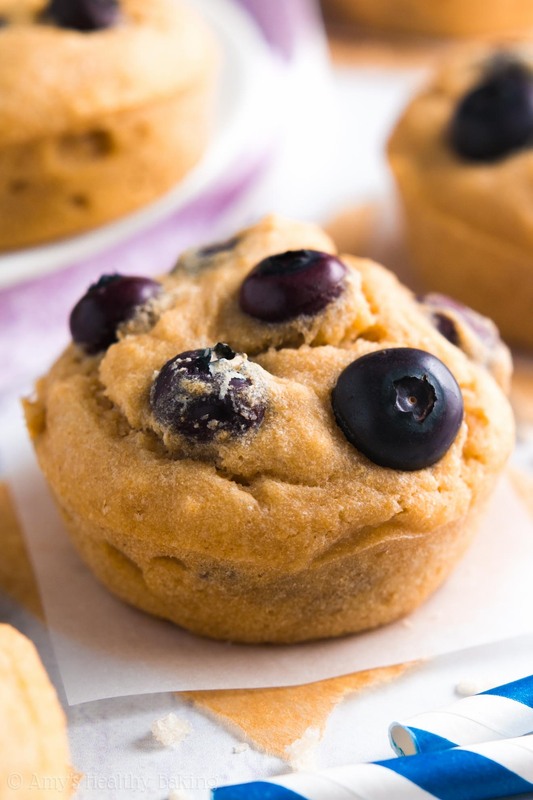 However, if you only have frozen, then reserve 1 tablespoon of flour, and toss the frozen blueberries with that just before folding into the batter. They will still bleed some and turn the batter grayish in color. I did these muffins, to be honest, this was the first time EVER that I bake something. I think they turned out good, to be the first time. But, they weren’t sweet enough for my taste! How can I make them sweeter without altering the consistency of the batter? I ask this because my second experiment was the lemon poppy seeds muffins, which I wanted sweeter so I added honey to them (honey was not an ingredient in that recipe), but the result was not so nice… the muffins were the opposite to fluffy, they were rather packed (and still not sweet enough). I am in the UK, so I am using wholemeal flour instead of white whole wheat flour that you suggest. And for the stevia, I don’t have exactly the same one you use, I found “Nutri-Nick Vanilla Stevia Drops”, not sure if it has the same sweetness level as the one you use! I’m SO honored that you chose my recipes as the first things you ever baked!! That means so much to me Gaby! 🙂 Let’s get this sorted out for you! Does your Nutri-Nick Vanilla Stevia Drops bottle have a conversion factor on it? Most stevia products will say how much of them you’ll need to equal 1 teaspoon of sugar. That will help us understand if your stevia isn’t as concentrated (and therefore the reason why your muffins are bland!). Thanks so much for this super-healthy and yummy recipe! one of the best out there! I wanted to ask you a couple of things. I’d like to add some cocoa powder without having too much of a chocolate flavor, how much of the flour could be replaced by it? do I have to modify the amount of liquid too?. And if I use Stevia powder (SweetLeaf), is it alright to use 2 tsp to substitute the creme stevia? I really appreciate your interest in my recipe Orian! To substitute for the vanilla stevia, you’ll need 2 ¼ teaspoons of SweetLeaf’s powdered stevia. If you’d like to add cocoa powder without the muffins having an overpowering chocolate flavor, I’d recommend substituting ½ cup of cocoa powder (make sure you measure it like this, or with a kitchen scale!) for an equal amount of flour. No need to modify the amount of liquids! 🙂 I can’t wait to hear how your muffins turn out! Amy, thanks a lot for your swift answer. I have already tried the cocoa version and they were good, however I’d strongly suggest to keep the amount of cocoa lower, 1/4 cup max. (at least for the organic brand I found in Norway). More than this and the batter starts to dry out noticeably, and if the cocoa is a bit bitter it would mess up the original flavor from your recipe. Other than that it’s a nice combination with blueberries! I have no idea what I did wrong but these were horrible. There was no batter consistency so they came out of the oven the same way they went in. I am wondering if I can treat them like cake flour, add liquids and bake again! So sad ? I really appreciate your interest in my recipe Deborah! Let’s figure out what happened so your next batch of muffins turns out perfectly tender. 🙂 Did you make any substitutions to the recipe, including any of those in the Notes section underneath the Instructions? Also, how did you measure your flour — with measuring cups or a kitchen scale? These were delicious! I used strawberries because that’s what I had on hand, and doubled the batch size. I made half in a mini-muffin tray so I could take them to work. FYI, my co-workers also thought they were great! They could hardly believe there was no added sugar! ?? Aw, baking these babies was the least I could do…our break room almost always has some sort of treat at the ready, so it’s my pleasure share the wealth! Also, your Honolulu story is delightful – I went there last year and did the same things (luau, Pearl Harbor), except we didn’t get a chance to see the Iolani Palace. It must be amazing!